In any other scenario, taking a picture of someone tapping another person on the back might be a bit strange. When it comes to the wonderful world of weddings, however, these moments — first looks — are commonplace. While the first look is just a brief moment in the grand scheme of the day, it can be surprisingly contentious deciding whether to have one or not. After all, the first look can affect the entire flow of the day, emotional tone of the wedding, and the way you and your partner experience the day. No big deal, right? If you’re struggling to make these decisions, consider the advantages of having a first look. Keep an eye out for part two of this series where we’ll discuss the disadvantages of first looks. One of the reasons to have a first look is to have a relatively calm, quiet moment with your partner before the chaos of the day. If you think about your wedding as any other big life event, chances are that you’ll want your partner by your side as a support. With weddings, though, partners often spend entire half-days apart. Even with wedding parties around, this separation can certainly send anxiety butterflies spiraling. If you know you or your partner is the type to seek emotional comfort during chaotic times, having a first look can really help to alleviate the pressure of the big day. “Logistics” might be the least romantic concept in the world, but it’s important when it comes to first looks. 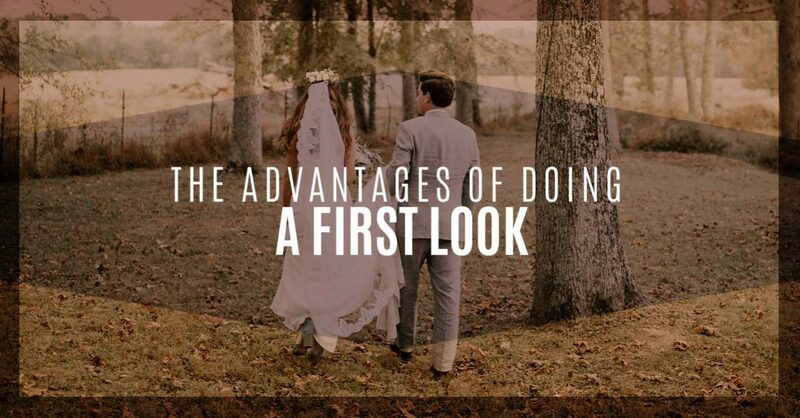 If you’re having an evening wedding, especially, having a first look might be the best way to ensure you get in enough pictures before the ceremony. Because you’ve already seen each other, you can take a few important pictures, go your separate ways before the ceremony, and then reunite to enjoy the reception — rather than having to take all of the pictures during the reception. Is there anything more pure than the moment you first see your partner? Whether you know what they’ll be wearing already or everything is a complete surprise, there’s something so special about this moment. It captures raw emotion, pure joy, trepidation, love, and comfort all in one. Even if first-look pictures seem a bit sappy to you on the surface, we promise they’ll be some of your favorite photos from the special day. Alegria Gardens is the Top Rated Local® wedding venue in Katy, and we’re here to help you every step of the way. We offer in-house vendors, including catering, transportation, and photography and video. Check out our wedding page to learn more about our wedding events. Because our vendors are used to working in our wedding venue, they can ensure smooth transitions, give expert advice, and make your special day as stress-free as possible. Host your wedding at a small piece of Paris in Houston. Just give our wedding venue in Katy a call today!